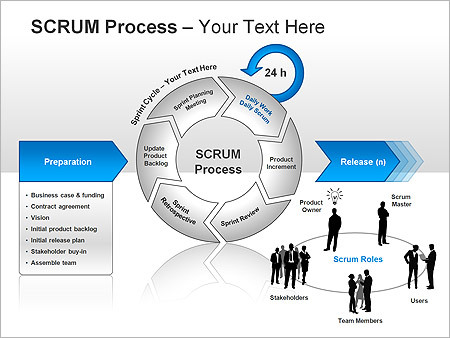 Scrum is an agile method for project management developed by Ken Schwaber. Its goal is to dramatically improve productivity in teams previously paralyzed by heavier, process-laden methodologies. A living backlog of prioritized work to be done. A brief daily meeting (called a scrum), at which progress is explained, upcoming work is described, and obstacles are raised. Scrum is facilitated by a scrum master, whose primary job is to remove impediments to the ability of the team to deliver the sprint goal. The scrum master is not the leader of the team (as they are self-organizing) but acts as a productivity buffer between the team and any destabilizing influences. Scrum enables the creation of self-organizing teams by encouraging verbal communication across all team members and across all disciplines that are involved in the project. A key principle of scrum is its recognition that fundamentally empirical challenges cannot be addressed successfully in a traditional “process control” manner. As such, scrum adopts an empirical approach - accepting that the problem cannot be fully understood or defined, focusing instead on maximizing the team's ability to respond in an agile manner to emerging challenges.